Snowfall is an American 60 minute scripted crime television series, which kicked off on July 5, 2017, on FX and is broadcast every Thursday at 22:00. The show is currently in its 2nd season. FX has officially confirmed the renewal of Snowfall for Season 3. The exact release date is yet to be announced so far. Sign up to track it down. Los Angeles, 1983. A storm is coming and it's name is crack. 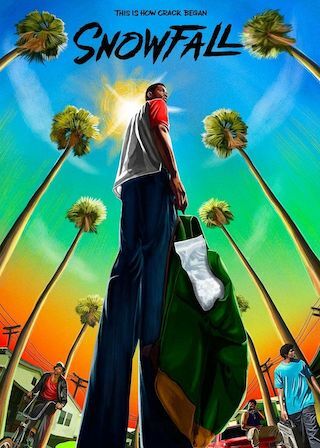 Snowfall is a one-hour drama set against the infancy of the crack cocaine epidemic and it's ultimate radical impact on the culture as we know it. The story follows three characters on a violent collision course: Franklin Saint, young street entrepreneur on a quest for power; Gustavo "El Oso" Zapata, a Mexican wrestler caught up in a power struggle within a crime family; Teddy McDonald, a CIA operative running from a dark past who begins an off-book operation to fund the Nicaraguan Contras and Lucia Villanueva, the self-possessed daughter of a Mexican crime lord. In season two, Snowfall continues its riveting story about the infancy of the crack cocaine epidemic and its ultimate radical impact on the culture as we know it. Season two follows our ensemble of characters as they intersect and overlap within the mosaic of Los Angeles as we enter 1984, all of them working toward their ultimate goals of money, power and influence, including: Franklin Saint (Damson Idris), a young street entrepreneur beginning to experience the perils of success; Teddy McDonald (Carter Hudson), a CIA operative who finds that his off-book drug-funded operation may be vulnerable from unexpected sources, both personal and professional; and Gustavo "El Oso" Zapata (Sergio Peris-Mencheta) and Lucia Villanueva (Emily Rios), the drug running couple who discover the potency of crack and try to exploit it despite the new dangers involved. September 19, 2018 - FX has ordered a third season of Snowfall, the drama series created by John Singleton, Eric Amadio and Dave Andron, it was announced today by Eric Schrier and Nick Grad, Presidents of Original Programming for FX Networks and FX Productions. The third season will premiere on FX in 2019.